Here’s a funny story: Santa stopped by our offices a few years ago. Trust us, we were as surprised then as you probably are reading this. Nevertheless, he walked in and handed us a few little trinkets and very nice little gifts (except for Murphy, who got a lump of coal for always taking the last bit of coffee and never making a fresh pot). Slowly, however, it dawned on us that he had something he needed to get off his chest. He complained that we didn’t have any Santa costumes for sale. Sure, we had elf costumes and reindeer costumes, and ugly Christmas sweaters. We had Santa hats and tons of bells and ribbons; but he was right, we didn’t have any full Santa costumes. Classy Santa costumes. How could we have missed such an important and crucial outfit? Well, needless to say we got right to working on this Plus Size Premiere Santa Suit. And you know what? We’re pretty darn proud of it. Even the big guy himself said it was a job well done. He complimented our craftsmanship and the use of luxe materials: the warm red coat with faux fur lined trim, the black belt with the iconic golden buckle, the boots that are sturdy enough to travel around the world, and of course, the snow-white gloves that will keep your hands warm, in even at the North Pole. Show Mr. Claus the love he deserves and don his holly, jolly look. Bring joy and festivities to all your loved ones, young and old, and help Santa recoup some of that self-esteem our oversight undoubtedly caused him. He probably won’t forget the kind act. 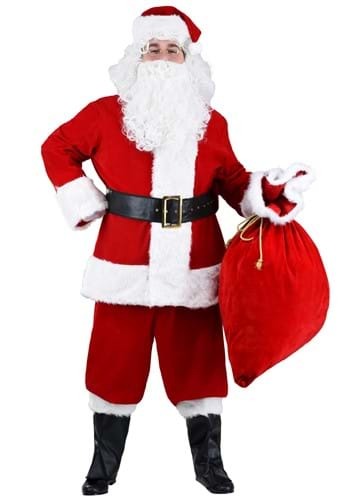 We ordered this for Christmas 2013 along with the wig set in the picture and the "Santa Sack" with the embroidery (He also wore black fishing style boots and the white gloves) at the same time as our Halloween costumes. The Santa suit was just beautiful and a big hit with both the kiddies and adults! It will certainly be a cherished and fun part of every Christmas from now on! As an added bonus my Hubby and I both won "Best Costume" and "Best Couple Costumes" at the Halloween Party! I advise hanging up the costumes as soon as you get them, and hang them up in the bathroom at least twice (more for the heavier fabrics) while you shower to get rid of the wrinkles.We were both pleased and very impressed of the quality and fit of all three (be sure to use their measurement charts and not your clothing sizes) costumes, and the prices were very good, including those of the extra goodies! In fact I regularly recommend HalloweenCostumes.com to family and friends for year round costume needs! We are return customers for 2014! The Suit fit very true to size , good Quality . Would buy again if needed another . I'm sorry that you felt that way, were you able to reach out to Customer Service about returning this by chance? They are always willing to help in situations like these! Received the suit and it looks Okay, but it's cheaply made and not worth the $270 that it cost. Some of my observations are things like several strings hanging on it and thin material. Not sure if they sent me the $70 dollars suit by accident, but if I hadn't already promised to be Santa at a church for a kids party, I would have sent it back. I held it up and could see right through it because the material is thin and not very dense. The fur areas are stitched in a way that you can see the stitching when it being worn and the red material hangs below the fur on the arms and the way its sewn there is no way to hide it. It states that it's made in China and it was probably made by the cheapest vendor. The pants only have an elastic waist and cannot be adjusted. I had to order the 4x even though I don't need it that big because of my shoulder width. I'm 6'4" 285 pounds and have to figure out a way to keep the pants up. I will have to spend another $40-50 dollars to have everything fixed on this suit. If this was the $70 dollar suit, I would say it was great, but its definitely not worth the $270. I got my Santa Suit today. I got my Santa Suit today. It is a thing of beauty!